* Total price is in AUD and includes GST and service fees. If you checkout without making all the selections you are entitled to, you will be able to return at a later time and choose your remaining options (simply log in to your moshtix account and return to the event page). Even if you checkout as a guest you will be able to create an account when you return to select your remaining options. Please note: Ticket options may sell out or become unavailable at any time. It is recommended you select your options as soon as possible. Tickets will not be refunded due to the unavailability of any ticket options. 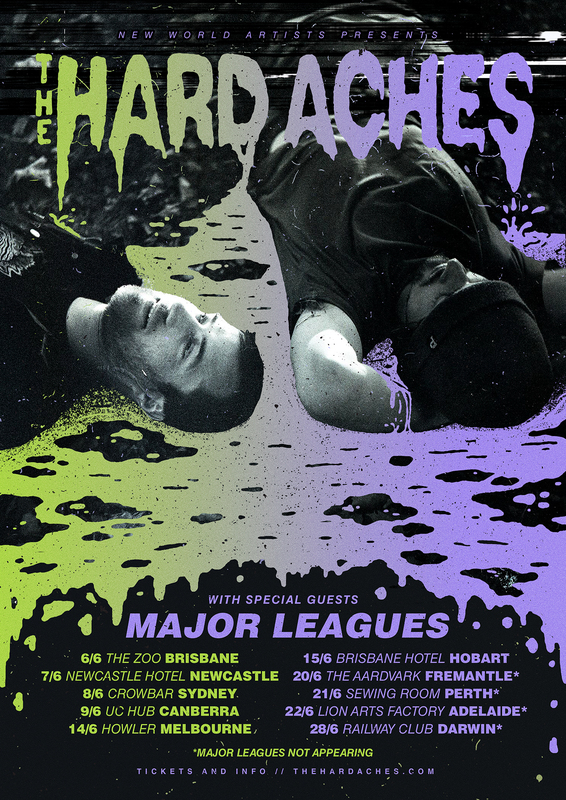 Australian indie-punks, The Hard Aches, have unveiled new Australian tour dates for June 2019, which follows previously announced Europe and UK dates throughout April and May. Queensland indie four-piece, Major Leagues, will be joining The Hard Aches on their upcoming Australian tour, which includes nights at Adelaide's Lion Arts Factory, Melbourne's Howler and Darwin's Railway Club, marking the band's first visit to the capital of Australia's Northern Territory. 2018 was a monumental year for The Hard Aches, with the Adelaide two-piece unleashing their sophomore album ‘Mess’ to rave reviews from critics and fans alike. ‘Mess’, released via Anchorhead Records, saw Ben David (vocals, guitar) and Alex Upton (drums), team up with esteemed Melbourne producer Sam Johnson (Camp Cope, The Bennies) at his studio in Holes & Corners, before engaging the talents of Grammy-Award winning engineer, William Bowden, to give the newly-formed punk anthems their finial finesse. As the band's songwriter, Ben has previously described ‘Mess’ as ‘The best representation of us as a Band’ and ‘The album we’ve been working towards creating through years of touring and making music." His notion is one that's shared among fans, who flocked to see The Hard Aches perform their new songs across two Australian headline tours throughout 2019.